Athena regularly appeared beside athletes who were doing all the things that had gotten Coach kicked out of a host of commercial gyms, and by the second issue of the CrossFit Journal, she was part of its masthead. Athena is still a prominent part of the Journal home page, and she’s the favicon beside the URL on CrossFit.com. 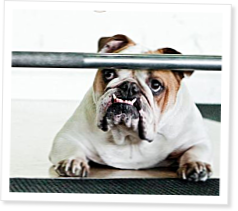 CrossFit Director of Training Nicole Carroll, who trained at the original CrossFit box, recalls that Athena was never on a leash and was “ever present” in the gym. The pit bull’s specialty was the box jump: she’d hop up on a plyo box and Coach would clap for her, which made her very happy indeed. L.A.-based photographer Michael Brian has been shooting CrossFit images for two years and specializes in pet portraits, making him the perfect person to capture CrossFit beasts and their four-legged friends in the rugged boxes both call home. The original CrossFit box is no longer around, nor is Athena, but memory of both is very much alive in CrossFit gyms and garages everywhere. For more images, visit www.michaelbrianphoto.com. Sorry for your loss. It's terrible when we loose a family member. Athena will live on in so many crossfitter's minds. I love dogs and love this article. I am thankful I belong to a box where Coach Tami Ough and the other members approve and welcome my stocky Lab, "Claude". Its become one of his favorite destinations. Claude's favorite WODs include running-go figure!